In a 3MT competition, you have three minutes to present your original thesis research with only one static slide. Sound difficult? It is! By taking part in a 3MT competition, you have a chance not only to practice your skills in public speaking. You also gain practical experience in how to condense the broad strokes of your research into a clear, concise, and exciting format. Watch videos of last year’s winners from the UChicagoGRAD competition! The application deadline for the Three Minute Thesis Competition is May 1. To complete the application form, please click here. For questions please contact Michael O’Toole: mfo@uchicago.edu. Any student currently enrolled in a graduate degree program at the University of Chicago and writing a Master’s or PhD thesis is eligible to apply. Participants will compete either in the Master’s or PhD category. Students in a PhD or combined Master’s/PhD program must participate in the PhD category. Each participant’s entry will be evaluated by a panel of judges. For a complete list of judging criteria please click here. Get involved in Graduate Council and Nominate your Peers for Graduate Student Leadership Recognition Awards! Get Involved – Join Graduate Council! Graduate Council is the representative governing body for the University of Chicago’s 8,000+ graduate students. In 2017-18, the Graduate Council Travel Fund and Finance Committee funded over 350 travel requests and 130 events respectively. In addition to providing financial support, Graduate Council also helped strengthen community by hosting 9 large-scale social events and 40 smaller community events. In close collaboration with divisional Dean’s Councils, Graduate Council works to advance the graduate experience by programming campus-wide events and hosting platforms for advocacy and issues discussion. The council is comprised of 17 elected representatives from the 12 graduate divisions and a team of committee chairs that focus on particular action arms (social, community, diversity, funding, & marketing). Graduate Council is always looking for motivated graduate students to get involved. Whether you want to help make decisions on funding applications, work on a specific issue, or run full-scale events, Graduate Council has a place for you. Join fellow graduate students in an effort to break down divisional barriers and create a university-wide graduate community. The Graduate Student Leadership Recognition Awards (G-SLRA) application is now live! The SLRAs are designed to recognize dedicated student leaders that have made significant contributions to improve graduate student life on campus. This year 25 awardees will be selected to each receive a $500 award. Applicants can be self-nominated or nominated by a friend, colleague, or faculty member. We’re excited to hear about all of the great work that our applicants do on campus, and can’t wait to reveal this year’s winners at our awards ceremony at the end of this quarter! You can find the application here. Navigating from a graduate program or postdoc into a teaching position can be both an exciting professional and intellectual experience as well as a challenging, uncertain transition. After spending many years at one particular institution, how can you understand the teaching cultures at different institutions and how to demonstrate fit? And once in a new position, what do teaching and other professional responsibilities look like and how do they compare to your experience at UChicago? This event will provide graduate students and postdocs from all fields of study with the opportunity to explore what it means to pursue a teaching career at a diverse group of institutions. In panels and small group lunch discussions, alumni from Chicago-area institutions and faculty from several liberal arts colleges will provide insight into the relevant skills and experiences that University of Chicago graduate students and postdocs might cultivate to prepare for successful teaching careers at a variety of institution types. They will also discuss how best to demonstrate and communicate these skills and experiences to hiring committees. Hear from alumni and faculty guests who have served on hiring committees about what hiring committees at teaching colleges are looking for in candidates. Gain advice on common pitfalls in the hiring process and how to effectively communicate your fit. How have early career alumni successfully transitioned into academic positions at teaching colleges? What makes work at these kinds of institutions interesting and valuable? Discipline-themed lunch tables will provide an informal setting for group discussion with alumni. Use the University of Chicago Library career resources to help prepare for interviews, learn about industries, explore books on career development, and gain valuable skills through workshops on software like GIS and Zotero. Company and Industry Research: The Library subscribes to many sources of information on companies and industries. These can be very useful tools for researching a company that has invited you to interview or an industry where you are interested in working. 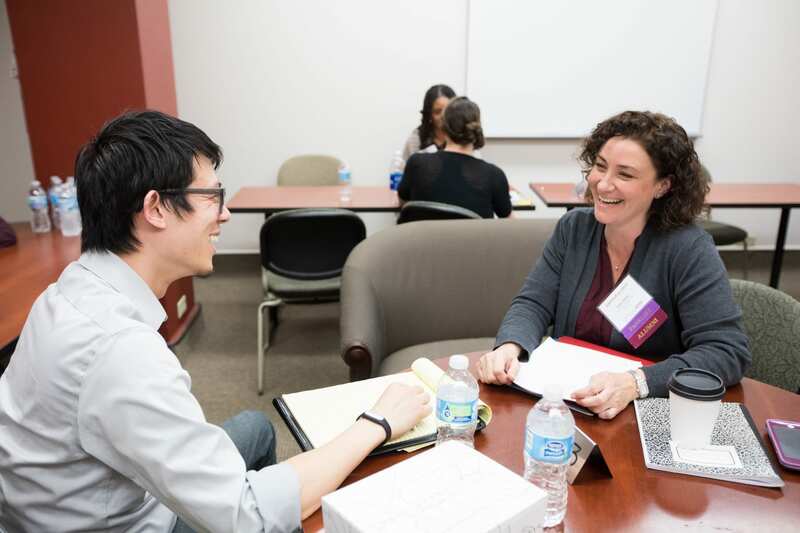 The Graduate Career Development Resources Collection is collaboration between UChicagoGRAD and the Library, and is made possible through the generous support of Danette (Dani) Gentile Kauffman and Diane Adams. The collection is located on shelving adjacent to the Ask a Librarian desk on the first floor of the Regenstein Library. GRADUCon Coffee Chats registration opens this week! GRADUCon is the University of Chicago’s annual career conference just for graduate students and postdocs. It is a fantastic opportunity to explore careers in academia, industry, nonprofits, and government. Over 400 graduate students and postdocs participate in the day-long program that included panel discussions and the chance to talk one-on-one with over 70 alumni about diverse career trajectories. Signups for one-on-one Coffee Chats with panelists will open on Friday, March 22nd at 5pm on a FIRST COME, FIRST SERVED BASIS. GRADUCon Registrants will receive an email invitation with Coffee Chat signup instructions. Registrants will be restricted to one appointment each until Tuesday, March 26 at 9am, when all remaining appointment times will be opened for sign-up. Last year, GRADUCon attendees and alumni had over 260 Coffee Chat sessions. Participants have consistently rated the Coffee Chats as their favorite component of the conference. April 1-5 is Grad Appreciation Week! Graduate & Professional Student Appreciation Week began in 1993, and is a celebration of the important role that graduate and professional students play on campuses throughout the U.S.
Join undergraduate, graduate and post-doctoral students, along with faculty and staff, and explore various themes of The Best We Could Do as it relates to our individual experiences and campus culture. Register here. For Digital Access to The Best We Could Do: click here. Attend the University of Chicago’s annual career conference just for graduate, professional school students and postdocs. Registration is required. Student Support Services utilizes a holistic approach to help graduate students thrive and succeed on campus. Ready-to-Cook meals from a local company, providing 2-3 serving meals; registered graduate students have choice of 5 different meal options. Immediate access to food resources, see more here. Monthly information sessions on government benefits, see more here. Undocumented student or DACA support services: assistance for grad/professional students who might be interested in renewing or learning more about renewal options for DACA, including application fees and legal referrals. We encourage undocumented (with or without DACA) graduate and professional students to engage with us as the first point of reference for questions or issues related to your status and to learn about other resources for undocumented students. FLI Network and the FLI Champions Program: convenes campus community members around shared identities and backgrounds. The FLI Network connects students, faculty, administrators, and alumni who identify as first-generation, low-income, or immigrant (regardless of immigration status), and allies with the goal of creating a community of support. The FLI Network creates opportunities for members to learn from one another. It fosters a sense of belonging, inclusion, and resilience in students in order to help them succeed at the University of Chicago. The FLI Champions Program matches FLI students with FLI Network members for a self-directed, coaching-style mentorship commitment. The goal of the program is to provide an opportunity for students to enhance their academic, professional, and social networks and skills, and provide the campus community with a meaningful opportunity to support and champion FLI students. The Champions are administrators, faculty, alumni, allies, and (as appropriate) grad/professional students who share similar identities, backgrounds, and interests. A champion is someone who understands all UChicago students have proven track records of success, and operates from a strengths-based attitude. GRADUCon is the University of Chicago’s annual career conference just for graduate students and postdocs. Now in its tenth year, the event is organized by UChicagoGRAD. GRADUCon is a fantastic opportunity to explore careers in academia, industry, nonprofits, and government. It includes panels, discussions, and the chance to talk one-on-one with employers and alumni about diverse career trajectories. Coffee, Lunch, and a Reception are all included in the day. Each year the U.S. Department of State’s Bureau of Educational and Cultural Affairs announces the top producing institutions for the Fulbright Program, the U.S. government’s flagship international educational exchange program, published in The Chronicle of Higher Education. Overall, the University of Chicago came third on this list, with 30 total awards, including graduate and undergraduate. UChicago graduate students and alumni received more graduate-level Fulbright awards than any other institution in the country in the 2018-19 Fulbright US Student Program competition. Nineteen graduate students and alumni of graduate programs from the University of Chicago were selected for Fulbright U.S. Student Program awards, with fifteen accepting the fellowship. The Fulbright U.S. Student Program is the largest U.S. exchange program offering opportunities for students and young professionals to undertake international graduate study, advanced research, and primary and secondary school teaching worldwide. The program currently awards approximately 1,900 grants annually in all fields of study, and operates in more than 140 countries worldwide. The program aims to increase mutual understanding among nations through educational and cultural exchange. These 8-12 month grants are open to graduate students in all stages and programs, and are available to US citizens in over 140 countries. Watch this short video and visit the website to learn more about the Fulbright US Student Program. The Fulbright competition for graduate students is administered at the University of Chicago through UChicagoGRAD. The 2020-21 competition will open in April 2019 with an internal Deadline for Campus Interviews of August 30, 2019. Interested graduate students should plan to attend the Fulbright Information Session in early April and contact Sara Mehta, Fulbright Program Advisor for graduate students, at srmehta@uchicago.edu to discuss the application process. Wellness Coaching, Mindfulness Meditation Courses, and visits to the WellNest lounge will teach you important self-care techniques that last a lifetime. Health Promotion and Wellness at UChicago offers students access to coordinated and comprehensive services that promote lifelong behaviors and empower individuals to improve their quality of life and reach their highest potential. Wellness Coaching: Wellness Coaching is a free service that provides support for navigating transitions and overcoming challenges that come your way. Wellness Coaching takes a strengths-based approach to holistic wellness and mental health promotion. Your wellness coach will help you: maximize your personal and professional potential by recognizing your strengths and values, focus on goals that are impactful to you, identify resources that will enable you to succeed in your desired changes, lead to a higher level of health and well-being, and strive to become your best self. Wellness coaches can provide you with tools for time management, social anxiety, stress reduction, and any other challenges that you face. Schedule a coaching session here. Mindfulness Meditation Courses: Register for introductory or advanced mindfulness meditation courses and a silent retreat focused on mindfulness meditation. Each Mindfulness Meditation course is held over four weeks and includes instruction and practice of mindfulness meditation and other mind/body techniques to help reduce stress. Research has shown that incorporating mindfulness meditation practice in your daily life can help: decrease stress and anxiety, improve concentration and attention, promote greater awareness of body sensations, emotions, and thought, build compassion for self and others, foster meaning and purpose, develop connections, regulate emotions, increase capacity for reflection and insight, and boost tolerance of uncertainty and ambiguity. Learn more here. WellNest Student Lounge: Provides students with a space where they can relax and take care of themselves during the course of the day. The WellNest is a quiet space where students can study or nap; it offers two massage chairs and wellness stations with coloring, aromatherapy, and other stress reducers. Visit the WellNest at 950 East 61st Street, Room 363. Health Promotion and Wellness along with Student Health and Counseling Services offer a range of services and support for students that are targeted towards building and maintaining overall well-being. For more information about other wellness programs and services as well as those related to medical and mental health, please visit wellness@uchicago.edu.